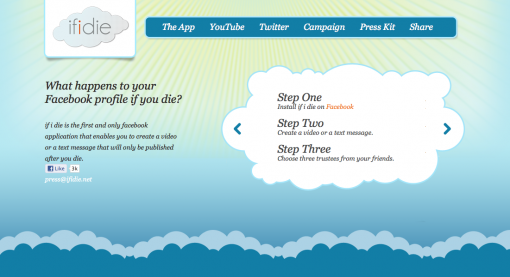 Enter ifidie, the Facebook app that offers people the chance to prepare messages that will get published on the social networking site even if they are already dead. Famous last words. Life after death (in a way). I don’t know if you have ever thought of what would happen to your Facebook account when you die, but I have to say that this thought has never occurred to me. But now that I have discovered ifidie, I think that the account will die as well. C’est la vie. While I am on Facebook practically all my waking hours, I am not too bothered with it on the account that I die. In any case, if you want to make sure that you get your last words out there for your Facebook friends to see, ifidie is the app you have been waiting for. It’s easy to use, just install ifidie while you are using Facebook. You will then be prompted to create a message, either in text or video format. The last thing you need to do is to appoint three friends as trustees. Since I have not installed the app (I honestly don’t know if I ever will), I can only make the assumption that the trustees will be the ones to pull the trigger that will publish your after life message. If you are concerned about security – who isn’t with Facebook? – the makers of ifidie insist that all messages are stored in a secure server. I guess you just have to take their word. A “weird” thought that just occurred to me – this is the perfect app for people who have suicidal tendencies. Then again, Facebook already has its own anti-suicide measures, which has hopefully helped those in need. So what do you think about ifidie? Useful or superfluous?